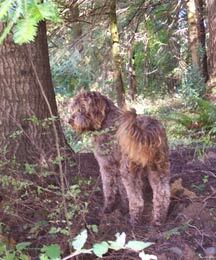 US Washington (Titan) Titan is from US Labradoodles in Tennessee. He is a standard with an apricot, spiral fleece coat, and he is from the Rutland Manor lines. He is Coco's best friend and loves new games to play. Stud service available. Tegan Park Chiffon arrived from Tegan Park in Australian the summer of 2004. She is a standard cafe' with a curly fleece coat. Although Chiffon is an avid outdoor-dog that loves to run, jump, and hunt for "wild animals," she is always ready to come in the house and take a nap on her favorite pillow. Washington Katerina (Kat) is our cream puff ball from Chiffon's 2004 litter. She has a silky fleece coat and is a small standard. Kat is a happy dog that is full of energy and loves to play, play, play, get tummy rubs, and give kisses. Killara Ridge Coco Chanel (Coco Puff) arrived Christmas 2004 from Killara Ridge in Oregon. She is chocolate with a wool coat. She is a standard size adult. Coco is a little mischievous and keeps us entertained with her adventurous personality. Washington Missy (Missy) is one of our own beautiful puppies and will be carrying on our multi-generation lines from Australia. Everyone adores Missy's sweet personality. She loves to play with Brenda's grandchildren or to just hang out and snuggle.